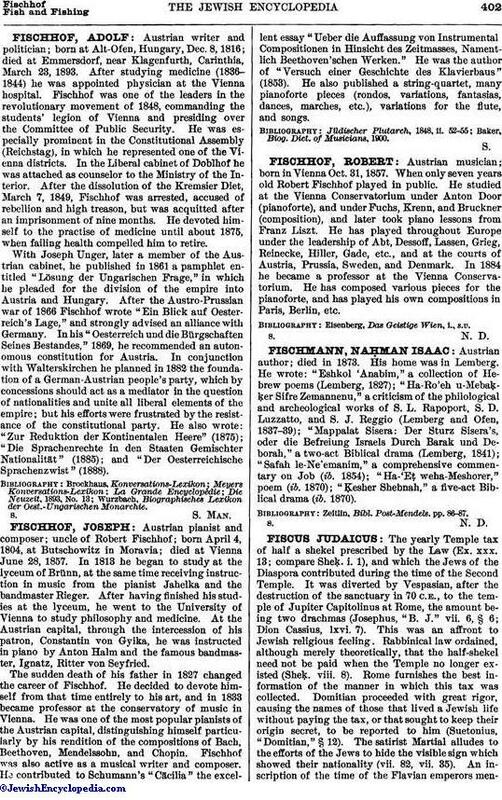 Austrian pianist and composer; uncle of Robert Fischhof; born April 4, 1804, at Butschowitz in Moravia; died at Vienna June 28, 1857. In 1813 he began to study at the lyceum of Brünn, at the same time receiving instruction in music from the pianist Jahelka and the bandmaster Rieger. After having finished his studies at the lyceum, he went to the University of Vienna to study philosophy and medicine. At the Austrian capital, through the intercession of his patron, Constantin von Gyika, he was instructed in piano by Anton Halm and the famous bandmaster, Ignatz, Ritter von Seyfried. The sudden death of his father in 1827 changed the career of Fischhof. He decided to devote himself from that time entirely to his art, and in 1833 became professor at the conservatory of music in Vienna. He was one of the most popular pianists of the Austrian capital, distinguishing himself particularly by his rendition of the compositions of Bach, Beethoven, Mendelssohn, and Chopin. Fischhof was also active as a musical writer and composer. He contributed to Schumann's "Cäcilia" the excellent essay "Ueber die Auffassung von Instrumental Compositionen in Hinsicht des Zeitmasses, Namentlich Beethoven'schen Werken." He was the author of "Versuch einer Geschichte des Klavierbaus" (1853). He also published a string-quartet, many pianoforte pieces (rondos, variations, fantasias, dances, marches, etc. ), variations for the flute, and songs. Baker, Biog. Dict. of Musicians, 1900.